We woke up bright and early in Alaminos, Pangasinan, excited for our morning trip to the Hundred Islands. As with the previous evenings, we’re sleeping in a different place tonight: Subic Bay. Today’s itinerary looked easy enough on paper: only three activities for the entire day. Unfortunately, each one is in three different places. The morning was spent at the Hundred Islands. Of the 123 islands, we were only able to step foot on two: Governor’s Island and Quezon Island. These two islands are two of the only three islands that were developed in the entire marine park. Governor’s island has a view deck that can be reached upon climbing 120-something uneven steps. 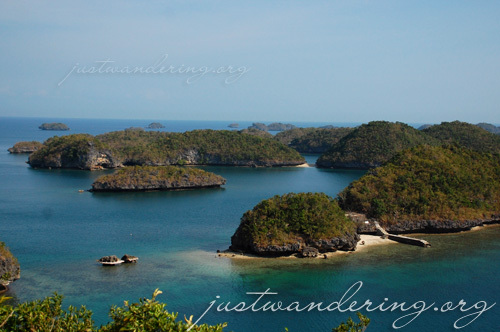 It’s a pretty light and easy hike and you’ll be rewarded with a fantastic view of the islands. Governor’s Island is also where the Pinoy Big Brother house is located, which can be rented for Php 10,000 per night. The house has a couple of bedrooms, lots of beds, kitchen, dining area, toilet and bath. Should I kayak or swim? Quezon Island has more buildings in it, which includes a rental shop for various watersports. There’s also a pavilion where groups can have a picnic. 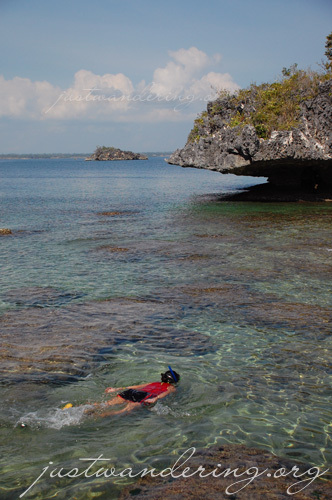 Though the beach is rather small, there are areas where you can swim, kayak or snorkel. For lunch, we feasted on grilled pork, grilled bangus, shrimp, vegetables and seaweeds. Dessert was sweet locally harvested ripe mangoes. Sadly, we still have places to go, so we packed up and headed back to the mainland. We drove on, following the coastline to Masinloc, Zambales. Here, we learned about their programs aimed to preserve the region’s diverse and endangered marine life. They’re taking the program further by offering eco-tours that aim to educate the public. The tours allow you to partake in the town’s efforts to help the environment like mangrove planting. Ironically though, the marine biodiversity of the town is under the shadow of the coal fired thermal power plant. After the presentation, we boarded the bus and headed to Subic, our final stop for the night. Our first activity in Subic was the Tree Top Night Adventure. The Subic Extreme Adventure park that I experienced in 2004 has transformed into a one-stop high flying adventure zone. Different adventure packages are being offered from tame canopy walks to the adrenalin rush inducing tree top drops. We finally end up at White Rock Resort for drinks and karaoke. This is our home for the moment, until we check out at 6am. The rent for that PBB house used to be a LOT cheaper. hmmm. Hi! I just recently started reading your site. I really enjoy it! Anyways, my family and I (my wife is from Puerto Rico and I I grew up in Manila-we also have our five yr old son w/ us) will be visiting the Philippines in April. From March 29 to April 4 we will be in Makati(I know –Holy WeeK) . Do you have any suggestions? I really have no idea what stays open in Manila during Holy Week. I’ve been to Hundred Islands last year and its very exciting to climb to the summit of Governor’s Island and see the panoramic view from the view deck. meron ba bus from Zambales to Pangasinan? 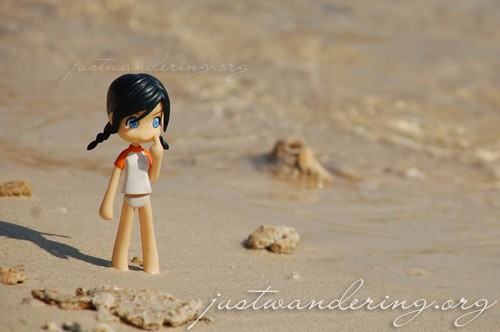 Love your doll on the beach photo!